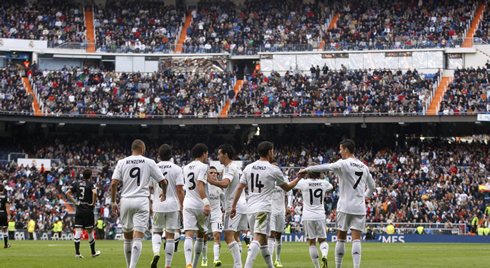 Two Champions League teams clashed at the Santiago Bernabéu this Saturday afternoon in a La Liga fixture, as Real Madrid ran over Real Sociedad with a clear 5-1 result. 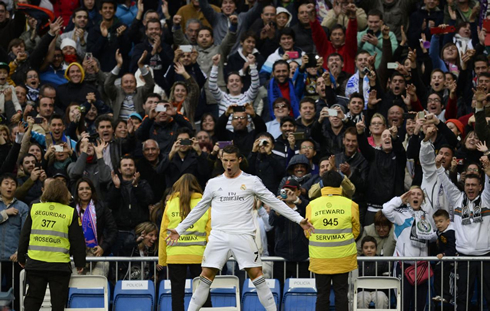 Ronaldo led the Merengues with his third hat-trick of the season and is now La Liga's top goalscorer with 16 goals. It's true it has been asked many times, but it doesn't hurt to keep asking: Is there any limit to Cristiano Ronaldo goalscoring capability? Real Madrid dismantled Real Sociedad into pieces through a 5-1 win at the Santiago Bernabéu, and the MVP was unsurprisingly the usual suspect: Cristiano Ronaldo. The former Manchester United winger bagged another hat-trick for his collection and made sure that the 3 points weren't going to slip away from the home side. Ronaldo stats this season are simply out of the chart and at this rhythm, it would be a total gamble to try to preview how many goals Ronaldo is going to score by the end of the year. Karim Benzema and Sami Khedira scored the remaining two goals against Real Sociedad, but we'll now go through a 2-week break so that the 2014 FIFA World Cup playoffs may take place. 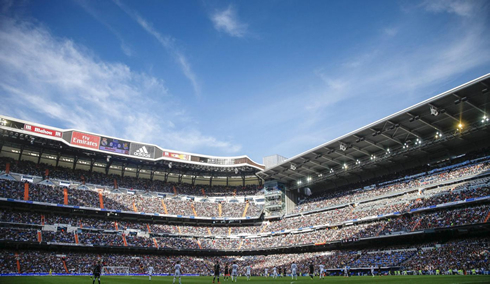 Real Madrid's next game will be on the 23rd of November, against Almería. Ancelotti has lined up the BBC (Bale, Benzema, Cristiano) partnership for the 4th straight game	and judging from the final score the Merengues have achieved, he certainly doesn't regret having done it. Bale, Benzema and Ronaldo each one picked up an assist and while the Frenchman scored another goal, CR7 netted his 3rd hat-trick for Real Madrid this season. Nevertheless, one of the best players on the pitch at the Bernabéu has been Luka Modric, who seems to be more confident game after game and especially since Xabi Alonso made his return to the team a couple weeks ago. The Merengues didn't give any signs of wanting to slow down after that first goal, and just 6 minutes later they found the right path to extend the lead. Cristiano Ronaldo made a good run on the left, sent in a low but strong pass to the middle with the outside part of his right foot and Karim Benzema finished it off with a flawless first-touch strike, giving no chance to Real Sociedad's goalkeeper. Great start from the men in white! The 4-0 came in from a great run by Carvajal on the right wing, who managed to move the ball forward for several meters just before leaving it for Gareth Bale in the middle. The former Tottenham Hotspur winger didn't waste time with extra touches to receive the ball and immediately passed it over to Sami Khedira, who was unmarked and in a great position to go for the goal. The German "Panzer" controlled the ball with his left foot and blasted it past Bravo, to set an expressive 4-0 in the scoreboard. Real Sociedad was looking as if they were handcuffed in the Bernabéu and everyone from the home side was getting chances to create danger. Sociedad's manager Jagoba Arrasate, was happy to see the first-half coming to an end and he sure had a lot to say to his players during the half-time break. Being down by 4 at the Bernabéu and still having 45 minutes left to be played could have been a likely scenario for leaving Madrid with an historical loss. That hasn't been the case though and the visitors came on to the second-half with a different mindset that allowed them to at least recover some dignity. 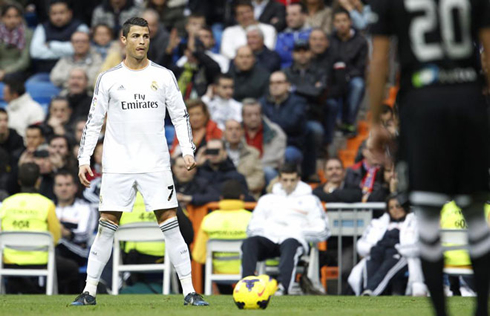 There was still plenty of time left for more action in the Bernabéu, but with Real Madrid slowing down the pace of the game, there has only only been room for the unstopabble Ronaldo to still shine in the remaining minutes... When Luka Modric went down near the right edge of Real Sociedad's penalty area in the 75th minute, we all knew Ronaldo had been given a golden chance to seal his hat-trick. Ronaldo's free-kick was so brilliantly taken that his shot simply left Bravo staring at the ball, probably just feeling helpless and unable to even attempt to reach out to it. 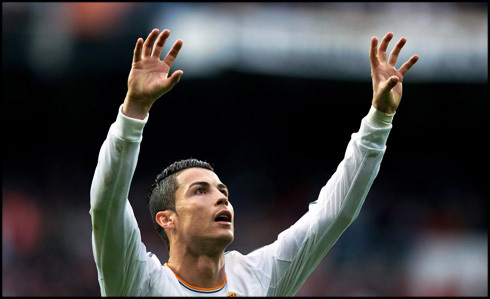 The 5-1 on the scoreboard wouldn't suffer any further changes and Ronaldo now leads La Liga goalscoring standings with 16 goals, 3 goals above Atletico Madrid's Diego Costa and 8 more than Barcelona's Lionel Messi. Both of them will have an opportunity to close distance to Ronaldo tomorrow though, since Barça will visit Betis and Atletico Madrid will travel to Villarreal. The most interesting game of this Sunday will be by far the Manchester United vs Arsenal clash, as the Red Devils will have no room to mistakes when they welcome the Premier League leaders at Old Trafford. The Gunners are on an impressive form, coming off two important victories against Liverpool last week and Borussia Dortmund for the Champions League just 3 days ago. Cristiano Ronaldo next game will be for Portugal, against Sweden for the 2014 FIFA World Cup Playoffs, this Friday (November 15, 2013). You can watch Juventus live stream, Portugal vs Sweden, Betis vs Barça, Man Utd vs Arsenal and Tottenham vs Newcastle, all matches provided from our soccer live section.